Automation Again? Scheduling Can Be Social! - Go Creative Go! Automation Again? 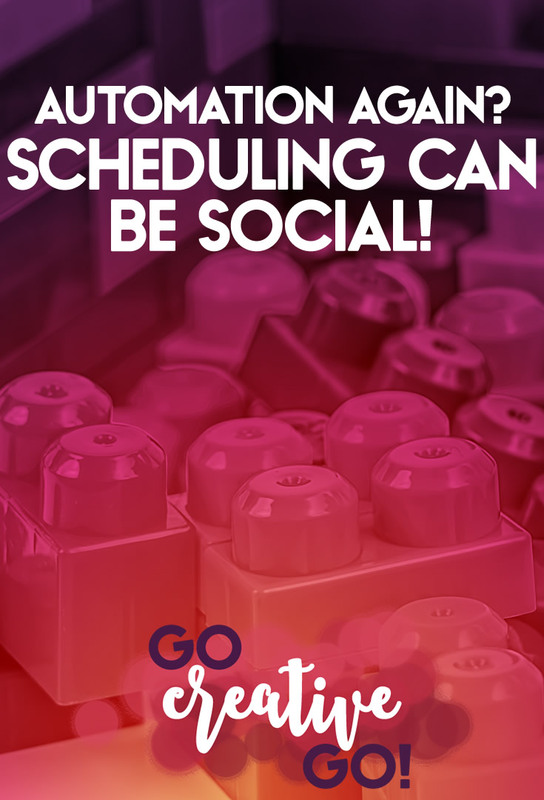 Scheduling Can Be Social! When it comes to topics for publication and discussion, good old marketing and social media automation – scheduling – is always a content marketer go-to. I’m very organic with my social media accounts. I’m really there. I’m not some robot that schedules everything a week in advance. Posts, though organic and “really there,” are probably sparse and not very consistent. If the accounts are jumping, organically, these individuals have little time to do anything else. Say, carry a full client load, for example. No matter which way you slice it, the use of scheduling tools is a topic that continues, and will for the foreseeable future, to crop up in social discussion. It’s more than the elephant in the room. It’s the GIANT in the room. The robotic, less than human, robot in the room! A misconception continues to pervade our industry, no matter the negative impact. That misconception? In order to be organic and timely with social media marketing, we can’t use tools to automate ANY of the social experience we’re trying to create with our audience. To quote one of my favorite TV characters, Dr. Sheldon Cooper, POPPYCOCK. To continue to quote him, MALARKEY. Certainly, scheduling tools can be used to the detriment of social presence, when the scheduler has no concept of what’s actually social. But that’s not the fault of the tool! When Using Tools, You Can’t Be A Tool! Scheduling tools can and DO work, and work well. As with anything that involves relationship building and management, there has to be a significant involvement. Involvement, of course, can not be scheduled. No matter how much you create, curate and share content, if it never drives any conversation it’s not going to create any connection. Connecting with your audience isn’t automatic, so it really can’t be part of your marketing automation plan. You can’t know in advance who is going to share your latest article, so you can’t schedule a thanks in advance. You’d look pretty ding-danged silly if they opted not to share that specific read! Schedule The Shares, Not The Conversations! We write, we edit, we publish. But that’s not the end. After that we promote. Automation certainly makes this promotion much easier. But it’s not a one and done kind of deal! Someone shares that carefully crafter bit of content marketing. Then what? You show some appreciation. You thank them. Ask what they’ve published recently. Ask how they’re doing, what they’re up to. The automated share sets up the opportunity to “speak” with those who read and share the post you’ve scheduled. That’s where the social comes in. We all have the same 24 hours in any given day. While we all need varying amounts of sleep in order to function well, we all need to sleep. We also need to eat, spend some time outdoors in order to get fresh air and Vitamin D, etc. I’m saying we all have to use our hours wisely and well if we want to get everything done. Scheduling is smart. Scheduling makes sense. It doesn’t mean “spur of the moment”, “on the fly” or “random”. That would make organic or IRL posts reactive, when in fact those in the business know social media requires one to be proactive. Consider organic products. They require time, effort, promotion, etc. There has to be some planning and scheduling involved. Planning and scheduling require tools. Those organic wool socks can’t be created without some sort of knitting implement. Even the simplest of plans requires some means to record it for future use. Automated & Attentive: The Winning Combination! Scheduling, or automation, is part of the social media process. Its value can’t be ignored. But, automation still isn’t an accepted part, for many, of the digital marketing process. Many still assume automation leads to cold, clinical, unmanned and inhuman feeds and accounts. I’m certainly not trying to tell you that smart and savvy responses can be handled with automation or on a strict schedule. The conversations that lead to real relationships do require a community or page manager to be more “on top” of things, more “go with the flow”. That being said, scheduling the posts themselves is smart, when done with the proper intent and purpose. How About You? How Do You Schedule? I’d love to deepen the discussion and hear about how you schedule smartly and still manage to stay social. Drop me a quick message via the comments and we’ll get the conversation going! Right on point Mallie! Everyone schedules posts, but you can’t schedule the conversation and responses. It’s all about being smart, savvy and social – even when using the tools that make marketing easier. Killer Content Marketing Creates Opportunity! Easy? ENOUGH! No More Shares If Easy Is Your Mantra!